Just at the dawn of MWC 2012, Samsung unveils 2nd generation Galaxy Tab 10.1 with projector mounted Galaxy Beam smartphone. 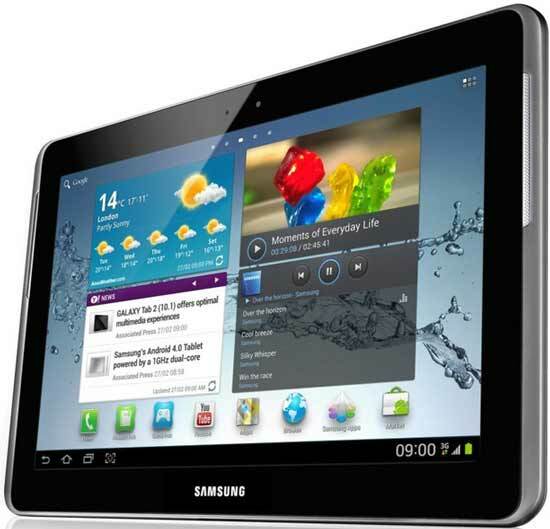 Galaxy Tab 2 10.1 has a 1280 x 800 resolution display with a 1Ghz dual-core processor, 1GB of RAM, Bluetooth 3.0 connectivity, front and rear cameras (VGA and 3-megapixels, respectively) and 21Mbps HSPA+ connectivity if you opt for the 3G model instead of WiFi. This new model is 9.7mm thin, thicker than iPad 2. The 10.1-incher notably comes equipped with a 7,000 mAh battery. The slate is unsurprisingly loaded with TouchWiz-flavored Ice Cream Sandwich, and will be offered in 16 and 32GB models with 32GB microSD card slot on both. There's no word on pricing just yet, but Sammy plans to start selling all 10.1-inches of this treat during March in the UK.